George and Amal Clooney enjoyed a night out with a couple of their showbiz pals earlier this week. Taking a break from their busy schedules of shooting movies and working as a human rights lawyer, the duo headed to see U2 perform with Cindy Crawford and her husband Rande Gerber. The A-listers watched Bono and his band rock the stage at the Forum in Inglewood, California. This must be one of the most star-studded double dates ever, right?! You won’t be surprised to hear that the Clooneys and their friends had a great time listening to tracks including I Still Haven’t Found What I’m Looking For. A fan spotted the group in the crowd and was quick to share a shot on Twitter. In the image an open-mouthed George appears to be mouthing along to a tune while Cindy’s man takes photos on his camera. Amal’s attention is focused on 54-year-old George but Cindy keeps her eyes on the stage. 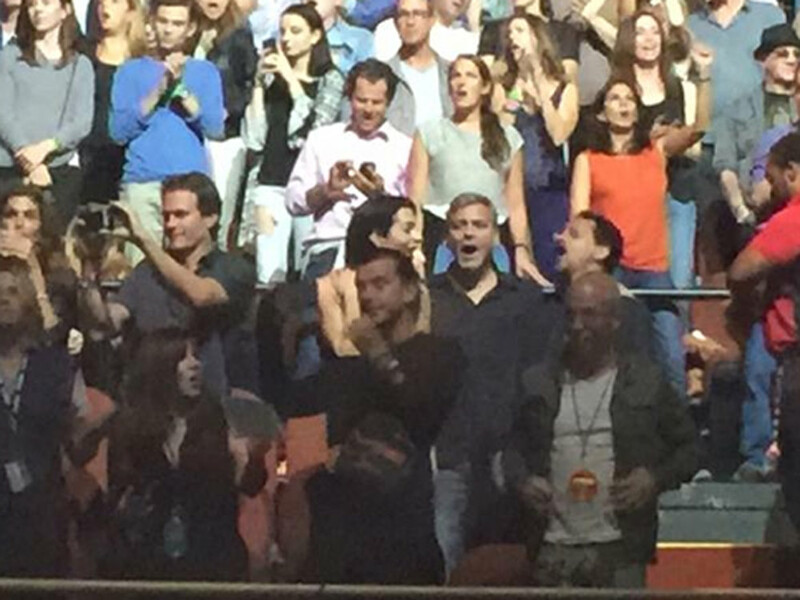 ‘@CindyCrawford @chelseahandler, @GavinRossdale, #GeorgeClooney, #AmalClooney take in @u2 last night. #U2ieTOUR,’ the image was caption. Perhaps in an attempt to go incognito, the newlyweds both dressed down for their date night. Because we’ve gotten so used to seeing George and Amal all glammed up on the red carpet at premiers and awards ceremonies, we always find it so refreshing to see them sporting more low-key looks. George paired a plain shirt with dark denim bottoms and Amal showed she’s mastered the art of casual styling in a black tank top and jeans. We’re not shocked to see that the pair bagged tickets to the show – George has been good friends with the U2 frontman for years.